Learn about fossil formation, presented with pictures and a descriptive tour of the process of Permineralization which is the most common process for preserving ancient plant and animal material. 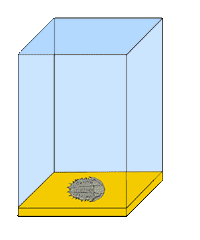 Common is a relative term when used in regards to fossils. Though there are millions of fossils that have been discovered and millions more waiting to be discovered, fossilization is a rare occurrence. There have been untold billions of creatures that have lived on the planet during the last 550 million years. When conditions on Earth caused mass extinctions, literally thousands, perhaps hundreds-of-thousands of species went extinct. For these species to be preserved, a series of truly fortunate events had to have occurred. If even one of these events failed, that animal or species would never be seen by modern eyes. Because of this, fossilization is actually a rare occurrence. It goes against the laws of nature that favor recycling. Just about everything that exists naturally on the planet, animals, plants, rocks and minerals, are designed to be reused or reformed to support some other species or life-form. Let’s narrow it down to animal species for a moment. All animals are designed to be someone else’s lunch. All parts, even the leftover bones, can be consumed by one species or another…right down to the bacteria that decomposes the sturdiest bones and shells. This makes a very bad situation for the formation of fossils. Since every part is designed to be gobbled up, the process has to happen before someone or something gets a hold of the food! In the first step of fossil formation an animal or plant must die in water or near enough to fall in shortly after death. The water insulates the remains from many of the elements that contribute to decomposition. In the following example a trilobite has died of old age on the bottom of the sea. Bacteria consume the soft body parts but leave the hard exoskeleton intact. As time passes sediments bury the exoskeleton. The faster this happens the more likely fossilization will occur. Land and mud slides definitely help. River deltas are also good for quick accumulation of sediments. This further insulates our trilobite from decomposition. 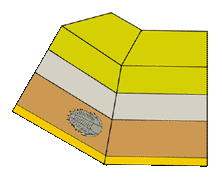 The sediments themselves have a huge influence on how well our trilobite fossil turns out. Very fine grained particles, like clays, allow more detail in the future fossil. 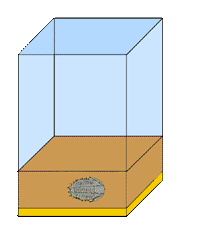 Course sediments, like sand, allow less detail to show. The chemical make up of the sediments also contributes to the future fossil. If iron is present it may give the rock a reddish color. Phosphates may darken the rock to gray or black. The possibilities are truly endless. 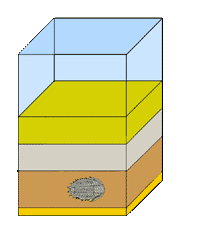 As the sediments continue to pile on, the lower layers become compacted by the weight of the layers on top. Over time, this pressure turns the sediments into rock. If mineral-rich water percolates down through the sediments, the fossil formation process has an even better chance of preserving our ancient animal. Some of the minerals stick to the particles of sediment, effectively gluing them together into a solid mass. These minerals make an impact on our original trilobite as well. Over the course of millions of years they dissolve away the outer shell, sometimes replacing the molecules of exoskeleton with molecules of calcite or other minerals. In time the entire shell is replaced leaving rock in the exact shape of the trilobite. That is the fossilization process at work. As the continental plates move around the earth, crashing into each other, mountains are formed. Former sea floors are lifted up and become dry land. This is exactly what has happened to our trilobite in the picture below. Now fossil is complete but our trilobite is buried under hundreds or even thousands of feet of rock! Thanks to the movement of the plates, our trilobite will come closer to the surface and nearer to discovery by some fortunate fossil hunter. Luckily nothing stays the same. 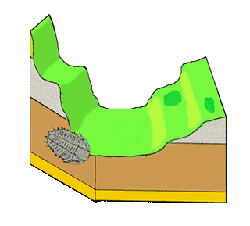 Fossil formation is revealed by erosion. Wind, rain, freeze and thaw, even earthquakes will help force the trilobite out of its burial ground and out into the light. If he or she is lucky enough, the trilobite will reveal itself in time to be spotted by a rock-hounder or fossil-digger. Who knows? It could even be YOU!